Audit Scotland said health boards were increasingly reliant on Government loans. NHS: Struggling despite £13.1bn investment last year (file pic). 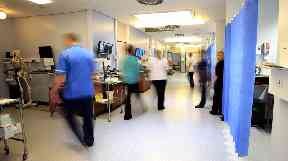 NHS Scotland is not financially sustainable, the public spending watchdog has warned. A report from Audit Scotland found health boards were "struggling to break even" and no part of the country had met all of the key national targets for the service - with NHS Lothian failing to achieve any of the eight. With increasing pressure on NHS services, and rising numbers of people on waiting lists, auditor general Caroline Gardner said "decisive action" was now needed from ministers to secure the future of the "vital and valued service". She stated: "The performance of the NHS continues to decline, while demands on the service from Scotland's ageing population are growing. The report stated: "NHS boards are struggling to break even, relying increasingly on Scottish Government loans and one-off savings", and the "declining performance against national standards indicates the stress NHS boards are under". The only target met nationally in 2017-18 was for drugs and patients to be seen within three weeks, with only three of Scotland's regional health boards meeting the target for patients beginning cancer treatment within 62 days of being referred. While performance against each of the eight national targets fell the greatest drop was in Child and Adolescent Mental Health Services (CAMHS), with the proportion of youngsters seen within 18 weeks down from 83.6% in 2016-17 to 71.2% in 2017-18. Health boards made "unprecedented" savings of £449.1m, but many relied heavily on one-off savings for this, while three boards - NHS Ayrshire and Arran, NHS Highland and NHS Tayside - needed £50.7m of loan funding from the Government to break even. This was "significantly more" than in previous years, with Audit Scotland adding four boards have predicted they will need a combined total of £70.9m in the current financial year. The report said the NHS is managing to maintain the overall quality of care, but it is coming under "increasing pressure", adding Brexit would create "additional challenges" for the health service. However the scale of these was "difficult to assess" because of "significant uncertainty" over the terms of the UK's withdrawal deal from the European Union, and because data on workforce nationality is not routinely collected. Dr Lewis Morrison, the chair of the British Medical Association (BMA) in Scotland, said the warning "could not be any blunter". He added: "Funding in the NHS is simply not keeping pace with demand and that has pushed NHS services across the country into the parlous position this report details." The report prompted widespread criticism of the Scottish Government from opposition parties. Labour's Monica Lennon said: "After more than a decade of SNP complacency our NHS is in crisis." Health secretary Jeane Freeman claimed the government was already taking forward Audit Scotland's recommendations. She said: "While our NHS faces challenges, common with health systems across the world, we are implementing a new waiting times improvement plan to direct £850m of investment over the next three years to deliver substantial and sustainable improvements to performance, and significantly improve the experience of patients waiting to be seen or treated. "Ultimately we want to ensure people can continue to look forward to a healthier future with access to a health and social care system that continues to deliver the world-class compassionate care Scotland is known for."